How does one get a divorce? To get married in Ontario, the spouses attend City Hall and purchase a marriage certificate. However, in order to be divorced, the same two spouses need to apply to the court and have a judge grant a court order for divorce. That is, getting married is an administrative task handled by a governmental department, whereas divorce is a judicial process requiring court forms and the signature of a judge. Before describing the steps necessary to obtain a divorce order, it is important to understand what is the meaning of the word ‘divorce’. A divorce is a term used to describe the dissolution of a marriage. Technically, even separated spouses are still considered husband and wife until a judge signs the divorce order. This can have negative implications such as estate rights stemming from death, the right to death benefits from life insurance policies and pension plans and the right to make end-of-life decisions for the spouse who is declared incapable – if separated spouses are not divorced. This is why is is important for separated spouses to apply for a divorce as soon as possible after their separation. 1 – Spouses need a separation agreement or final court order. Despite the need for a divorce order to end a marriage, there are other issues that need to also be resolved such as parenting of the children, support and property division. These issues are called corollary issues. The corollary issues are often resolved outside of court and then documented in a separation agreement that is signed by the spouses after receiving independent legal advice from separate divorce lawyers. Often, judges will not grant a divorce order unless there is a separation agreement or court order setting out the terms of settlement of parenting, support and property division. 2 – At the time of the application for divorce, the spouse who is seeking a divorce (called the applicant) needs to decide what is the legal basis for the divorce. Under Canadian law, this can be adultery or cruelty or their separation for a period of no less than one year. The most common basis for divorce is separation. The spouses do not need to wait until the one year has passed. A divorce application can be started right after their separation, however, the judge cannot sign the divorce order on this basis until one year has passed. Spouses who are choosing to use adultery or cruelty as the basis for divorce will have the extra onus of proving this in court. In order to expedite matters, and not need to prove that there was culpable behaviour, most spouses choose to use separation as the basis for divorce – even if in fact there was a history of adultery or cruelty. 3 – After the divorce application is completed, it is then taken to the local courthouse to be stamped by the court clerk who will then give it a court file number. There is a fee for this. A copy of the application must then be personally served upon the other spouse. This cannot be done by the applicant, but must be done by another person who is usually an independent process server. The date that the application is served upon the other spouse triggers a deadline of 30 days. If the other spouse does not deliver a defense to the request for a divorce, then the applicant may return to court, 30 days later, and ask that the divorce application be placed in front of a judge for signature. 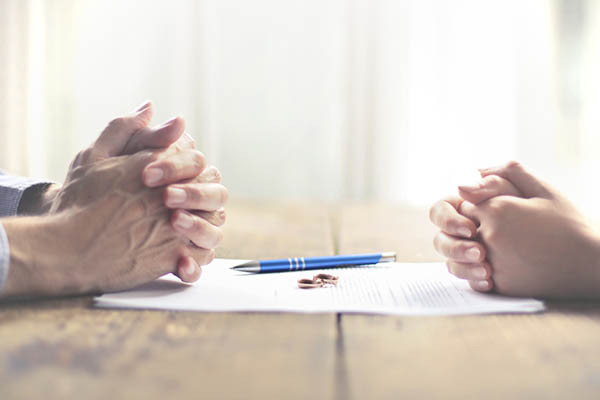 4 – If 30 days have passed after the delivery of the divorce application upon the other spouse, and the other spouse has not defended the application, then the applicant will need to fill out an affidavit for divorce and provide three copies of a draft divorce order for the judge to sign. There is another fee for this. The affidavit for divorce will set out all of the particulars of the marriage and divorce including the legal names of the spouses and the children, their dates of birth and the details of the settlement of parenting, support and property division. It is at this point that a judge could decline the divorce – if there is no proof of settlement of the corollary issues. Assuming the judge is satisfied that the corollary issues have been settled, then the judge usually signs the divorce order. The divorce order is then mailed to each spouse. 5 – The date that the judge signs the divorce order begins another 30 day waiting period. The reason for this additional 30 day waiting period is to provide the spouses with an opportunity to change their mind. Canadian law recognizes that marriage is sacred and divorce is final. That is why the policy is to give spouses one final opportunity to reconsider their decision to divorce. The divorce becomes final 30 days after the judge signs the divorce order. After a divorce order is granted, either spouse can apply for a copy of a certificate of divorce. The certificate is just another document evidencing the divorce. Sometimes, people use the certificate of divorce instead of the divorce order because it does not include any of the personal details included in the divorce order such as parenting, support and property division. All in all, the process could take around 3 months to complete – provided both parties do everything required at the earliest opportunity. Delays by either side and disagreements over the corollary issues are typical reasons that make the process take longer.